When I went for my first midwife visit with this baby, the nurse was asking all of the usual sorts of questions for health history and such. Then she threw me a slider. I was on my back with a doppler to my exposed belly. It was a little awkward. “What . . . do I . . . eat?” I wasn’t sure what she was looking for and I wanted to be precise. “Uh, Jac made scrambled eggs with bacon and toast . . .” I trailed off, unsure of where to go from there. Jac and I cocked eyebrows at each other. Cook? Yes, we do that – A LOT. And eating is a given. But healthy? Hmmmmm. . .
Sugar is a constant around this joint. I’ve never met a sweetened cereal I didn’t like (okay, cookie crisps are pretty gross). We all know my love affair with Oreos and Thin Mints and ice-cream. Soooo gooood. When the kiddos came along it didn’t seem right to keep it all to myself. I mean, it wasn’t like I was putting pop in their bottle or anything. It’s addict language, I know. We’re working on it. But let’s get to the point. The kids love their sugared cereals. Lucky Charms, Frosted Flakes and Apple Jacks top the favorites list. We buy it in the big boxes at Sam so it feels like a deal, but they go through it like water. All except for the Cocoa Krispies which is a crying shame because it’s included in the their favorite multi-pack. It tends to pile up and I do hate to let a good cereal go to waste. What to do? Seldom has pure genius struck me as it did with this recipe. After all, the only thing that could make sweetened cereal better would be corn syrup, am I right?! Plus no-bake cookies always seem so brilliant and awesome. These chocolatey-peanut-butter-balls-of-goodness quickly became favorites. I try not to make them too often because I will eat the majority of them and well, you know, that’s not so good. Anyway, a recipe that has peanut butter and corn syrup in it AND turns something rejected into something delicious is a serious winner. Try ’em and tell me I’m wrong, I dare you. In a large saucepan, combine corn syrup and sugar. Bring to a boil over medium high heat, stirring constantly. Cook until sugar dissolves. Remove from heat and add peanut butter, stirring until combined and smooth. Gently stir in the cereal and stir to coat. Drop cookies by heaping Tbsp onto waxed paper and allow to cool. You must work quickly! 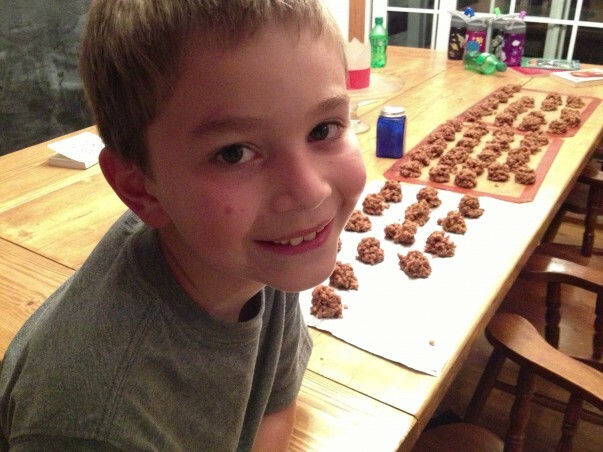 They’re Max’s favorite and his requested dessert on his feast day. He looks super thrilled here because he wanted to get on with the eating. I had already stolen a few. Also, fried cereal sounds delicious. “Not deep fried. No. Sauteed in butter. Like mushrooms, you guys.” Now you’re talkin’! I think you need a PIN button! This looks so yummy and easy, right up my ally. Oh and I just watched Charles! HILARIOUS! I think I might try a Lacey’s Mix! Yummy!!! My kids go through cereal like it’s water, too! Right?!?! I’ve been giggling all day. If you make Lacey’s Mix, let me know how it turns out!